College, the pilot will see the four strategic partners working together during this testing period. Nissan has been globally piloting the e-NV200 for two years ahead of the van going on sale to the public next year. As the UK's largest ever electric commercial vehicle evaluation to date, the winter test underlines the importance of the relationship between Nissan and British Gas to be involved in this important phase of zero-emission vehicle testing. 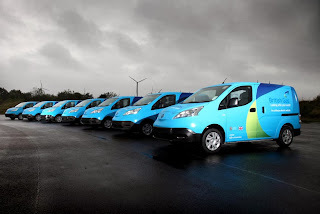 The pilot of the Nissan e-NV200s is being conducted nationwide from November 2013 until April 2014 to assess how the vans perform in winter conditions during typical British Gas home services daily usage patterns. As part of a long-standing contract to manage the entire fleet for Centrica, British Gas' parent company, Hitachi Capital Commercial Vehicle Solutions' dedicated British Gas team has been involved with extensive testing to prove the concept and played a key role in rolling out to engineers and then providing on-going 24-hour support. Hitachi Capital has also undertaken IMI training to a high level in conjunction with Gateshead College and will be involved in generating accurate total cost of ownership modelling to compare this technology with the conventional internal combustion engine drivetrain. Gateshead College has delivered all of the training to the British Gas drivers to ensure they are fully briefed in how to drive and live with the 100 per cent electric Nissan e-NV200. Local to Nissan's Sunderland Plant, Gateshead College is Europe's leading facility for training in LCV development and will ensure drivers are fully able to exploit the Nissan e-NV200. Available on forecourts next year, the Nissan e-NV200 is a breakthrough zero emission compact van that promises a dramatic reduction in running costs while also helping the environment by bringing CO2 emissions down to zero at the point of use. As British Gas home services engineers operate within a defined zone, the Nissan e-NV200 can easily operate within a British Gas daily usage pattern. "We're committed to leading the industry in reducing the amount of carbon and other harmful tail pipe emissions emitted by our 13,000 strong vehicle fleet, This trial, the largest of its kind in the UK, is a great opportunity for us to understand how the Nissan e-NV200 vans perform during the winter as we move towards our goal of having at least 10 per cent of our fleet running on electricity by 2015," said Colin Marriott, General Manager Fleet at British Gas. "We have worked closely with Nissan and Hitachi Capital to ensure that the Nissan e-NV200 is ready to support our engineers during even the most demanding of winter conditions. All 28 have also been provided with a British Gas home charging point and access cards to public infrastructure to keep the vehicles charged up. I would like to thank Nissan, Hitachi Capital and Gateshead College who have all supported us to make this trial a reality." Jim Wright, Nissan GB Managing Director added, "We're proud to be providing the vehicles and services for the UK's largest ever electric commercial vehicle pilot in conjunction with our strategic partners. Piloting such a large number of vans with British Gas in advance of the e-NV200 going on sale in 2014, underlines the closeness of our relationship and marks the final stages of the vehicle's development." "Our engineers will take the feedback of the British Gas drivers to ensure we launch a vehicle perfectly suited to British road and business conditions. With an expected harsh winter ahead, the 28 Nissan e-NV200s will be delivering home services around the country whatever the weather, demonstrating how strongly the 100 per cent electric van can perform for large fleets with challenging daily routines."